Talk to a few cat owners and they will tell you that one of the things that makes them happy is knowing that their small companion is healthy and happy too. Thus, purchasing one of the cool cat gifts available is a sure way to ensure that your fluffy pal gets something to feel appreciated and loved. Since the market is flooded with options that you can choose from, we have decided to make things a little easier for you by displaying some of our favorite options on the list available below. There you will find awesome cat toys, gadgets, and more. If you are the owner of a pet that tends to get bored quickly and you want to get a toy that can keep his/her attention for longer, you will like this gadget that features five games for the price of one. The first game features a globe that resembles a fish bowl and requires pets to scoop out treats with their paw. The second features a peg that will require the feline to plan a hunting strategy to get to the treats. The third game is a playful option that allows cats to earn treats while lying down. A fourth game involves the use of the tongue for liquid treats while the fifth and final activity features a tunnel that has a mouse hole where you can hide other toys and treats. There is nothing that cats find more welcoming and comfortable than a heated surface, and the Thermo-Kitty option is a heated mat that is thermostatically controlled to heat precisely to the normal temperature of your pet’s body when in use. This way, the surface won’t get too hot. The heater is MET listed and has a low 6-watt power, which means that it uses less energy than a light bulb. You won’t have to worry that using this nifty matt will inflate your power bill. What’s more, the heater and the cover can be removed for easy wash and care. Pet hair can be a huge problem, not only because it can get on clothes and furniture but also because it can trigger some nasty allergies. 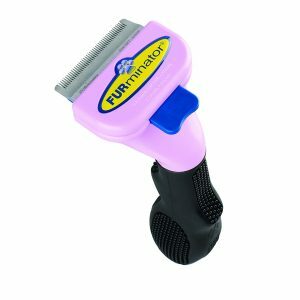 If you want to hug your dear companion whenever you feel like without worrying about hair getting on your clothes, you might want to consider getting the FURminator deShedding Tool. The gadget removes loose hair without damaging the coat of your cat or cutting the skin, as long as you use it as directed. You also get an ergonomic handle for easy and comfortable use. What’s more, you can use this option for dogs too, not just cats. Have you started to get tired of the daily trips to the trash to throw your cat’s litter? With the Litter Genie Plus Pail, you can say goodbye to all that and use this nifty disposal system instead. It is antimicrobial to inhibit odors that are caused by bacteria to keep your house smelling fresh. 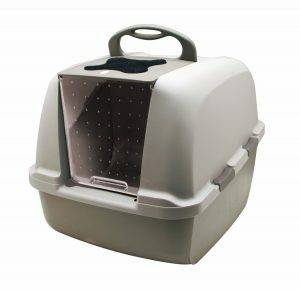 This unit can hold up to 14 days of cat litter so that instead of throwing the litter on a daily basis you can use the extra time to play more with your kitty. It comes in a very compact design that is perfect for small spaces and homes. Cats love lasers, that is an undeniable fact, but using a laser is not always exciting, and people can lose interest quickly. 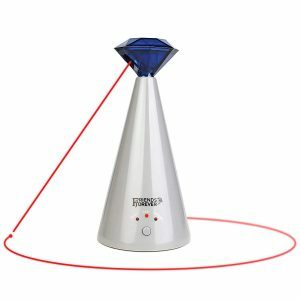 The Friends Forever gadget features an interactive laser that does all the work for you, which makes it a very convenient gadget. 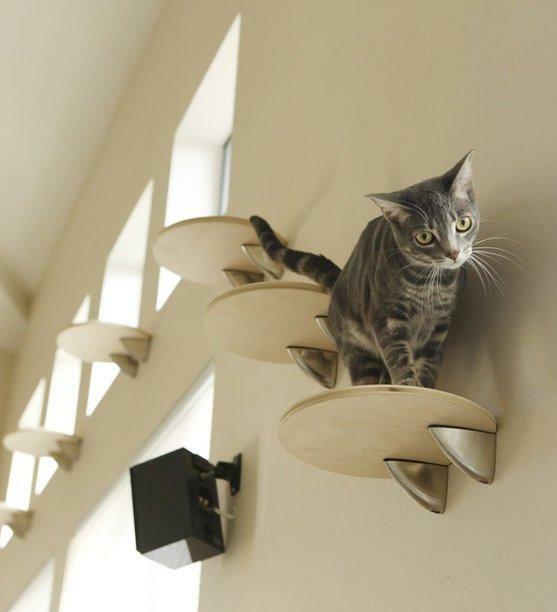 The device will move the laser randomly across floors and walls, appealing to the cat’s natural hunting instincts. It works on batteries which means that it is safe for pets since you will not have to worry about you or the cat tripping on the cable and destroying your new purchase. It has a 15-minute automatic timer to prevent your furry friend from tiring from too much self-play. Domestic cats nowadays do very little hunting, especially if they live in an apartment, but with the Catit Sense 2.0, your pet will feel the thrill of having to work for his or her food once again. The unit comes with three difficulty settings so that you personalize the experience depending on how active and ready for a challenge your kitty is. 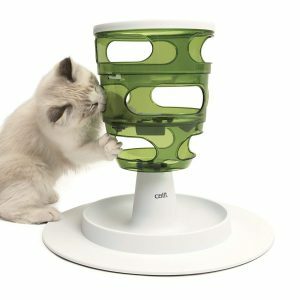 The toy features a wide and durable base for added stability, ensuring that your cat will not topple it over. Once playtime is over, you can easily disassemble and clean the toy (hand-wash only). With the Catit Fountain, your cat will always have access to fresh water, even when you are not at home, thanks to the triple action filter that will remove unwanted minerals and debris from the tap water. The filter will keep your pet healthy by preventing urinary tract diseases that can occur from an excess of magnesium and calcium. The unit has a 100-fluid ounce water reservoir, but it still manages to remain very compact and ergonomic. It takes very little floor space, certainly not more than a standard water bowl, and is much more stable than other fountains. If you’ve ever been away from home for more than a day without your cat, you probably know the struggle of making sure he or she gets enough food. 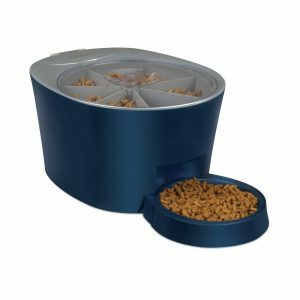 Friends or family might not always be there to save the day which is why we recommend this versatile automatic pet feeder that works for both cats and dogs. 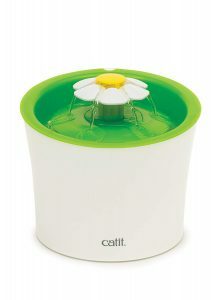 It has a pet-proof dispenser and lid to prevent prying paws from turning the tray and stealing food. It can feed multiple smaller pre-portioned meals throughout the day or one substantial meal once a day, depending on what your pet prefers. 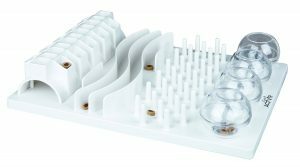 The removable bowl and tray carousel are dishwasher safe for easy cleaning. Cats like their privacy and this spacious and affordable litter pan comes with a removable hood that lifts up effortlessly for easy access when you want to clean it. 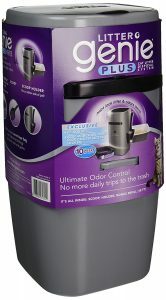 It also features a carbon filter that does an excellent job at removing unpleasant odors. We did mention that this unit is very spacious, but pictures don’t do it justice. 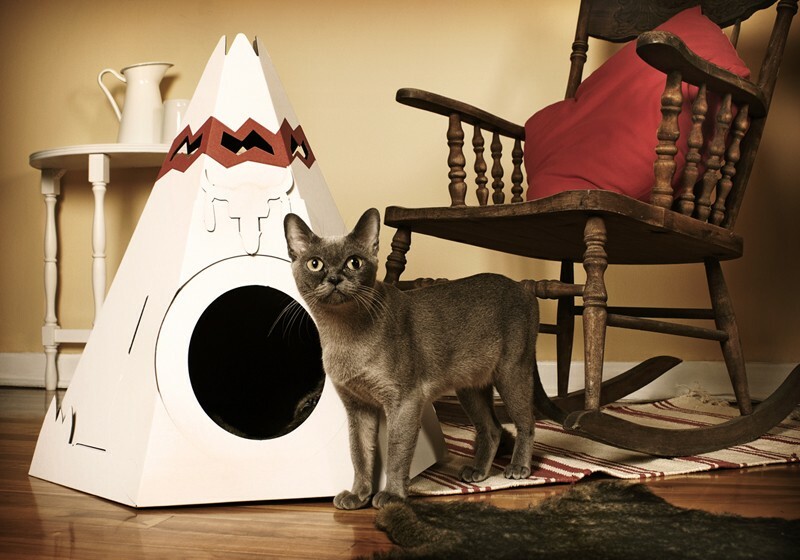 It is enough to say that that this hooded litter pan is perfect for multi-cat households. It is 22 inches long, 17 inches wide, and 18 inches tall. The door opening measures 10.4 inches by 9.6 inches, which is more than enough for even the fluffier cats. Cats can become quite fussy when they get bored, and we don’t think that you’d like for this to happen. In order to prevent that you should consider purchasing a gadget that would be able to keep both of you entertained and in an overall good mood. If you got to this article, it’s safe to assume that you lost your bearings a little bit in the vast sea that is the internet. Your quest of finding the Holy Grail of cat gadgets has come to a turning point. Luckily, a helpful guide has appeared, and his purpose is to aid you. You should listen to what the guide says because the travel that awaits would otherwise prove itself very difficult. Leaving the mythological lore aside, we have compiled this comprehensive buying guide by gathering various reviews and advice, and we think you would benefit from giving it a look-see. Because even though cats seem to be very low-maintenance and ordinary pets some scientists argue that they have different personalities, so in all seriousness, you should treat this process of finding the right gadget for your cat like finding a gift that would make your friend happy and glad to be a part of your life. The best cat gadgets shouldn’t hide from you for a very long time. Sure, now all this might seem like a hazy mystery since they are lots and lots of different gifts you could give to your furry companion, but we read cat gadget reviews and we think we can help you in finding what you wish. Also, if a special someone’s birthday is coming up you can get an idea on what to buy by browsing for the best gifts for cat lovers that are currently for sale. It should be a fun ride so tag along. If you have a cat that is full of energy but your apartment is too small and it causes all kinds of accidents because the lack of space doesn’t allow it to tire itself out then good cat books advise that toys can be a solution to your problem. The prevention of accidents isn’t the only thing that should concern you in regards to your pet. Indoor pets have a lack of exercise that can affect their well being in time. The first option that is on everybody’s minds is the classic mechanical mouse. This little piece of machinery stimulates the predator instinct that resides in every household feline up to a point that it will be able to chase it for what will seem like forever. Still, if the mechanical mouse is moving all over the place, the cat will do the same in its pursuit. So, maybe you would like a more sitting down approach. You could have that by sitting on your couch and wave a cat charmer wand, another classic cat toy. And when you feel that adrenaline rushing in when you see those little fangs and claws that are threatening your hand you can move around and let the cat follow you around to your family’s delight. Some cat owners leave their tiny beasts to roam around the neighborhood, and that can cause problems as well because they are curious animals that love exploring. There are plenty of missing cats reports that unfortunately don’t come to a happy ending, especially if you live in a big city. For sure, you already know all this, and you already have some experience with this, but for your own peace of mind, you should consider a tracker. These devices are some of the best gadgets for cats because in an unwanted scenario that involves your companion getting lost they can lead you straight to them so you can come to their rescue. There are even tracking devices that can guide your cat home. The things to consider when browsing for cat trackers are plenty. Firstly, know your cat because if you don’t know how much it weighs or what are its day to day activities you might find yourself buying the wrong device. If you have a cat then you know that they like to scratch things to sharpen their claws. This comes from their ancestors that needed their claws to capture their prey. So don’t blame them and don’t cut them off, it’s a natural thing, after all, it’s their instinct. Instead of making them suffer or making yourself suffer when you try to put on a pair that used to look like socks try looking for a substitute. Cat scratchers reviews state that your feline would more than love to have a scratchy surface to sink its claw in. You should avoid low-quality scratching posts because this is never a good thing. Instead, one made to last will keep your cat happy and busy for a long time. You’ll find that your cat will benefit greatly from this because they will be able to exercise by stretching their muscles and they will eliminate stress along with the outer layer of their claws that they naturally shed. If the traditional devices are too old for your modern kitten, then don’t be concerned. Since the beginning of the internet, cats have become the stars of our lives so we should reward them. There are tons of gadgets that nowadays need a power supply, so you can forget about turning a key to activate a mechanical mouse. Of course, if you raise your cat right it won’t become fussy regardless of its means of entertainment, but that doesn’t mean you shouldn’t get any fun. There are modern toys that have cameras built in. And where is a camera there is an opportunity for a funny movie that you can share with your family and friends (and why not the internet?) for wholesome laughs. And since we’re on the subject of easing your life we all know that cats can be quite messy. Apparently, they are so messy that engineers designed some devices that help to clean their litter boxes. Just turn them on and let them do the work and all you have to do is change the bag when it’s full.